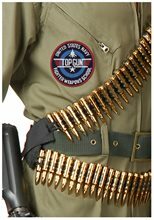 Top Gun Army Bullet Belt .Includes: One Top Gun Army Bullet Belt. Available Size: One Size Fits Most Adults and Teens. *Costume Not Included. Accessories Sold Separately. 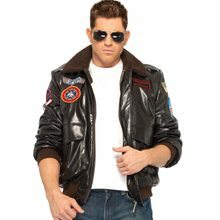 Complete your Top Gun Maverick costume with this military bullet belt. This bullet belt accessory will complete any army costume or Gaddafi costume. 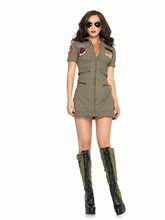 2pc Top Gun Dress Adult Costume.Includes: Top Gun Flight Dress with zipper front and aviator glasses.Available Sizes: Womens - Small (4-6), Womens - Medium (8-10), Womens - Large (12-14). (See Size Chart For More Information)*Boots Not Included.Material: 100% Cotton.Care Instructions: Hand wash separately. Drip Dry. Do not bleach. 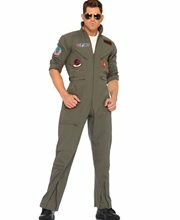 Iron low temperature.Top Gun Women's Flight Dress, includes zipper front flight dress with interchangeable Maverick and Goose name badges, includes logo aviator sunglasses.TM & © 2010 Paramount Pictures. All rights reserved.Made in China.